That Woosh! in your ears is the sound of Sen. John McCain's old man dreams and Bush-league (Cheney, too) New World Order wishes being flushed down the G.O.P. 's toilet of dirty politics. To paraphrase F. Scott Fitzgerald's The Great Gatsby, Monday night in Denver, Colorado was at least the first 15 minutes in 2008's extended hour of profound human change. 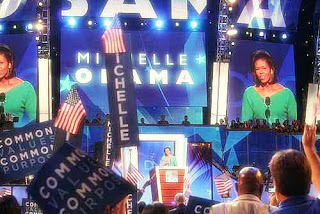 On August 25th, Michelle Obama, the wife of Sen. Barack Obama -- the man who will most likely become, GOD Willing, the next President of the United States -- gave a powerfully sobering speech rooted in historical significance and present-day relevance. It was a speech that spoke to the futuristic hopes of a nation looking for the true meaning of an increasingly deferred American Dream, a nation teetering on the brink of collapse. 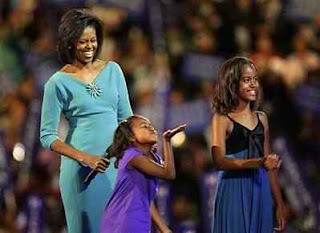 Last night at the Democratic National Convention in Denver, Colorado was an timeless night drizzled in tears. Tears of empowerment when the lionhearted Senator Ted Kennedy inspired a nation with his courageous words of hope and optimism as he effectively passed the torch of JFK and RFK to BHO, not once flinching as cancer held his body under siege. There were tears of recognition from some of the Hillary supporters who slowly began to realize that the enemy they feared was the sister they always had. There were tears of pride welling in the eyes of Marian Robinson watching her baby girl accomplish what she and her late husband Frasier possibly never imagined, but still prepared Michelle and her older brother Craig (the head coach of the men's basketball team at Oregon State University who introduced his sister onstage) for the challenges of a life beyond the windy corners of Chicago's South Side. 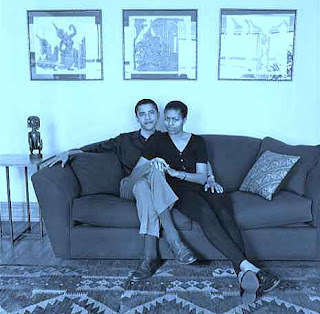 As the crowd in Denver and around the world gazed upon this regal African American woman in her royal blue dress, there were tears of grief shed for women just like Michelle who endured water hoses, police batons, and the ferocious incisors of German Sheppard dogs over 40 years ago. Actions that may have ripped their clothes and broken their skin, but not their spirit. Michelle Obama's eloquent speech to the Democratic National Convention was the beatific resolution of Fannie Lou Hamer's brutally beautiful struggle. There were also tears of joy and happiness when the precocious Sasha--the younger sister of Malia -- asked her dad, who was on the huge screen in a live feed from a family's house in Missouri, "What city are you in, Daddy?" That off-the-book moment, not guided by the campaign's media coaches or communication directors, crossed lines of race, status, and demographic, and softened the hardest of hearts: "That sounds like my daughter". how they gon' stop/both us?